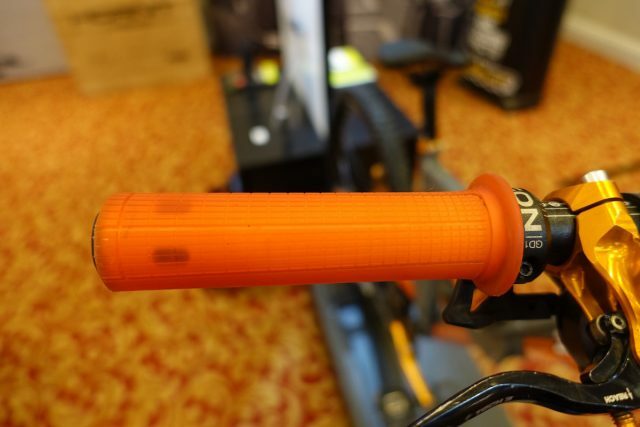 When it comes to the mountain bike grip, German brand Ergon takes a far more scientific approach. 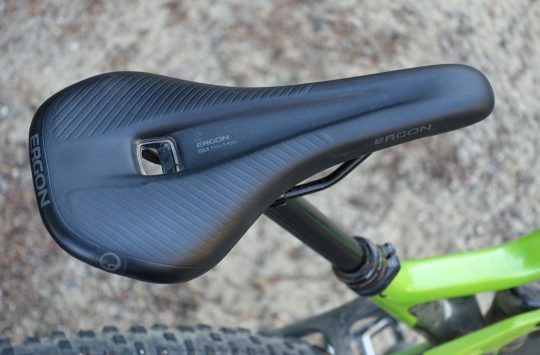 Best know for its range of ergonomic style grips with their flared wingtips, Ergon has more recently been concentrating its R&D efforts on grips for trail riders and enduro racers. We’ve been rocking the GE-1 and GA-2 grips for some time now, and rate them very highly for their comfortable hand position and tactile feel. 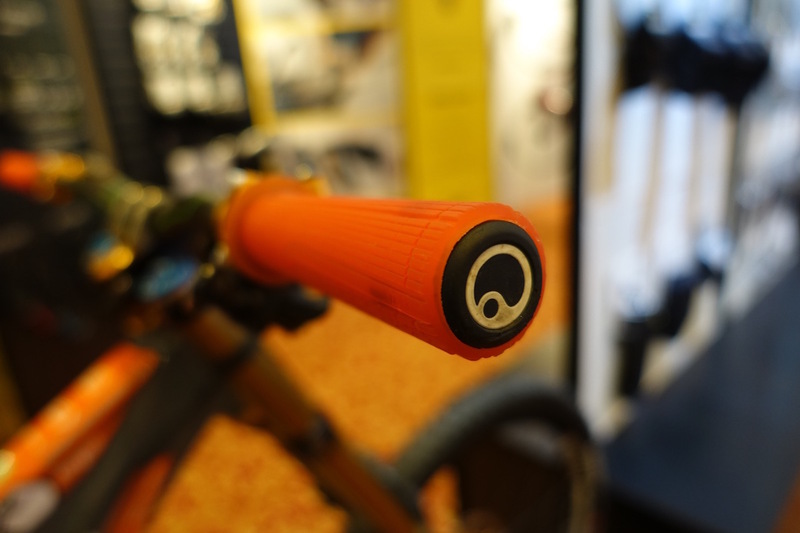 At the 2017 Core Bike show, British distributor, Extra UK was displaying a range of Ergon’s more recent innovations, including the GD-1 Factory Grips. And in typical Ergon style, there’s more detail than meets the eye here. 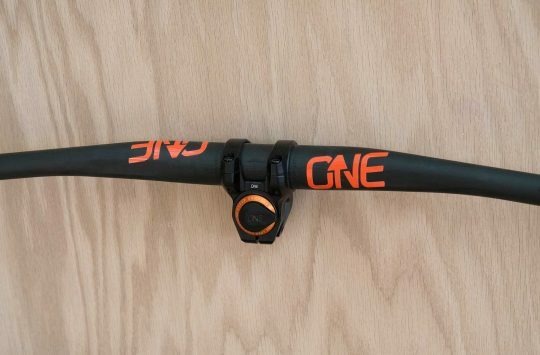 This is the GD-1 grip from Ergon in radioactive orange. Firstly, the GD-1 grip is very, very soft to the touch. Like Silly Putty sticky. It’s built with a proprietary rubber compound that’s manufactured in Germany, which offers specific rebound properties for controlled damping – just like suspension or a sticky tyre compound. With a textured surface that’s built with raised ridges on the underside for your fingers to lock into, the GD-1 grips are designed in such a way that you don’t have to grip the bejeezus out of it just to hang on. Underneath the rubber is a nylon sleeve that slides over the handlebar, and an integrated forged alloy clamp sits on the inside of the grip. 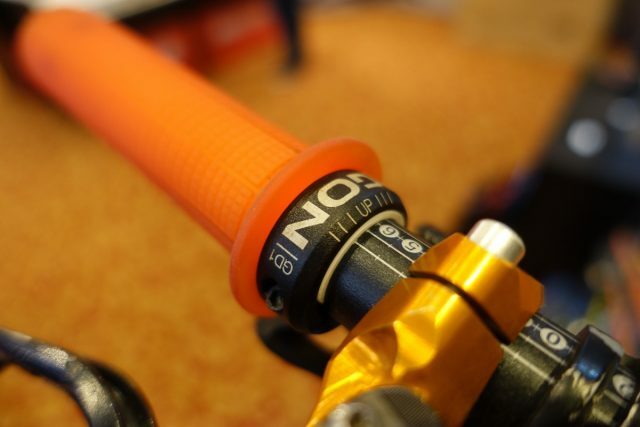 Like all other Ergon grips, there’s just the one locking collar, so those who run their hands wide on the bars don’t have to deal with a hard metal surface pressing into their palms. No locking collar on the outside. Just pure rubberised bliss. The really big deal with these grips however, is the shape. While the GD-1 doesn’t look all that different from the current grip favoured by aggressive trail riders, the GA-2, it actually features a subtle tapered design that places more material around the end of the bar, and a slimmer diameter closer in towards the locking collar. This tapered design apparently has a pending patent, and Ergon is very proud about it. Subtle tapering on the GD-1 grip. There are two sizes available in the GD-1 grip: Regular and Slim. On the outside, the Regular GD-1 has a 32mm diameter, which tapers throughout the length of the grip to finish up at a diameter of 30mm on the inside. On the Slim GD-1, that changes to 30.5/29mm. The idea is simple; put more soft material towards the outer part of the grip where your hands need it most. For further high-speed control, a small rubber flange is used on the inside of the grip. A 3mm hex key is all you need to install, adjust and remove the GD-1 grip. 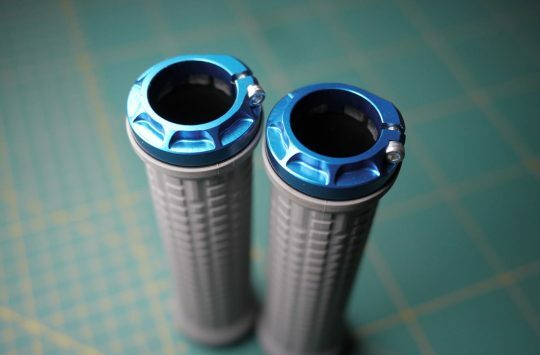 The single locking collar is initially formed from forged alloy, before it is CNC machined and laser etched. Markings on the collar are there to remind you which way is up, and they also help with adjusting grip rotation. A single 3mm hex key is all you need to install and remove the grips. The Ergon GD-1 Factory grips were being shown off at Core Bike in a rather snazzy opaque orange finish, though they’re also available in black too. Pricing is £29.99 for a pair. 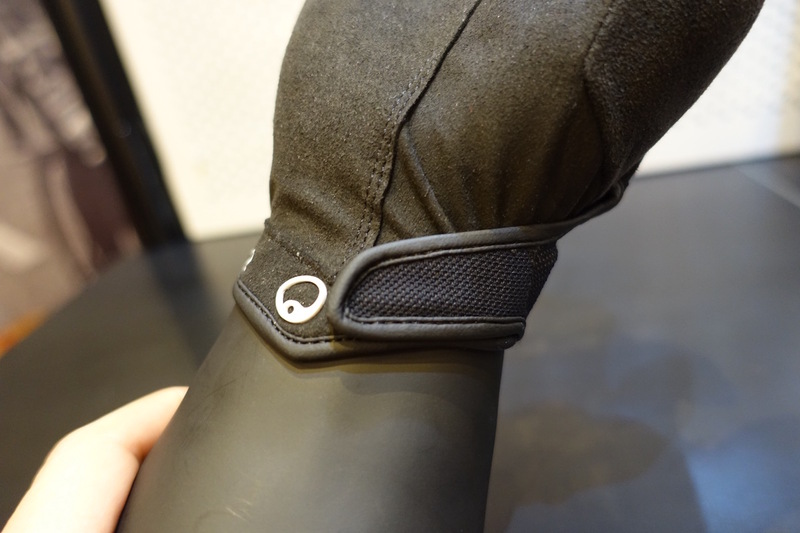 Ergon produces the HM2 as an all-round mountain bike glove. 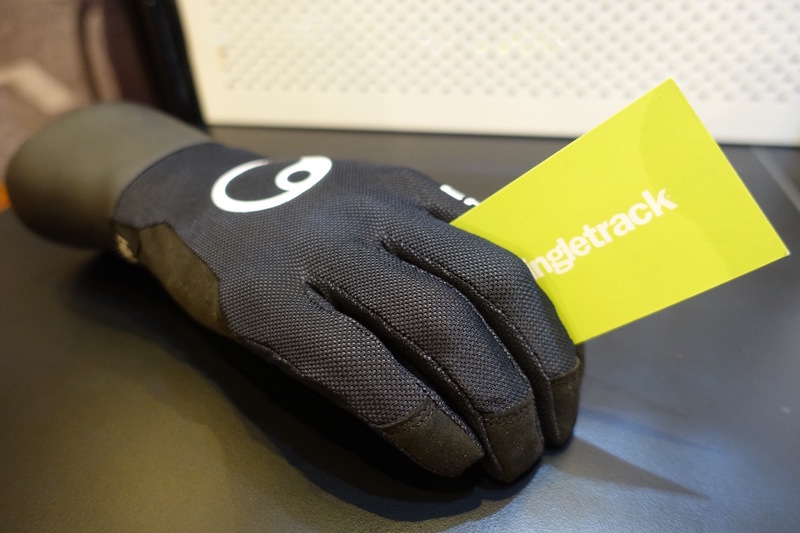 To match those snazzy grips, Ergon introduced the HM2 glove last year as a new lightweight option for mountain bikers of all persuasions. The HM2’s aren’t targeted specifically at XC or downhill riders, but really anyone who appreciates a minimally styled glove that’s big on flexibility and breathability. 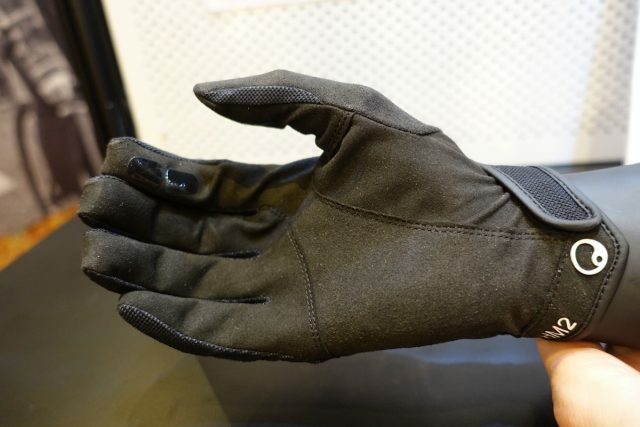 The back of the glove is made entirely of a mesh fabric, which covers the breathable aspect. If you want padding, look elsewhere. The HM2 is all about feeeeeel maaaan. There is no padding on the palm at all. Instead, a thin synthetic fabric is used that should deliver good feel on the grips and controls. 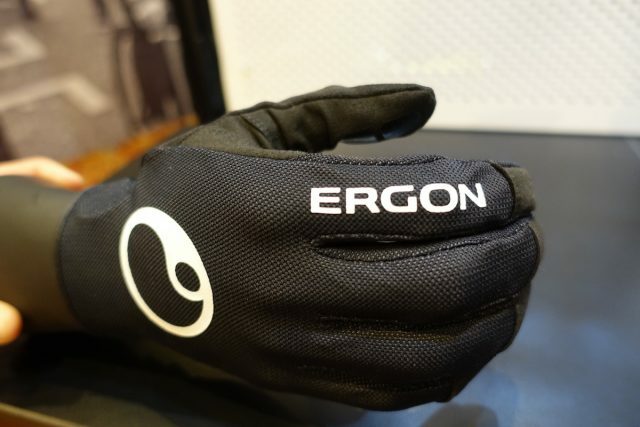 Ergon claims that the HM2 gloves are built with a tailored shape that makes the gloves “nearly free of wrinkles and bunching”. However, they also say that the HM2’s utilise “preformed fingers”. I’m not sure I want my new gloves to come with those, but I guess you can just empty those out before wearing them. Tidy velcro wrist strap that discreetly tucks in on the inside of the wrist. In its quest for comfort, Ergon has extended the glove’s base fabric along and over the top of each finger. This eliminates the typical seam that would normally sit right underneath your finger nail, which can be quite uncomfortable. Instead, the seam is found on top of each finger, about an inch back from the nail. It’s a simple design that we’ve seen elsewhere, but it’s one that we’d like to see with every glove. The Ergon HM2 gloves retail for £34.99, and are available in sizes from XS through to XXL. For more information about the Ergon range, check out the Ergon website or head to extrauk.co.uk. I want some of those tapered grips.